In 1817, construction began. By 1825, one of the most famous engineering feats had been completed — the Erie Canal! Mostly dug by hand, this 363-mile wonder stretched from Albany to Buffalo, connecting the Great Lakes with the Atlantic Ocean via the Hudson River. It transformed the history of New York and beyond, and today, you’re invited to enjoy Erie Canal cruises and experience a bit of that history! Just don’t forget to view our free Vacation Guide to discover even more historical sites nearby. It’s the ideal travel companion for exploring the wonders of Western NY! Learn All About These Incredible Erie Canal Cruises! The Erie Canal takes you on a journey to fascination, and Lockport Locks & Erie Canal Cruises can get you there! Their cruises are favorites among guests at Asa Ransom House, and we can’t recommend them enough. Captain Mike and Sharon Murphy began offering these informative adventures in 1987, and they keep getting better. Their location in Lockport, NY, is just a short drive from our inn! Cruises cost $18.50 and run from May to October. You’ll learn plenty of history during your two-hour adventure! Come and experience another piece of history by staying at Asa Ransom House! Our charming country inn in Clarence, NY, dates back to 1853! Today, we invite you to enjoy the luxury of our 19th-century themed accommodations for the ultimate relaxing getaway. We’re just a short drive from this Erie Canal cruise company, Buffalo, Niagara Falls, and all of the best things to do in Clarence! Experience the epitome of relaxation and romance when you stay in one of our elegantly designed guest rooms. The Country Garden Suite is an excellent example, showcasing some of the fine accommodations and amenities you can expect with us. 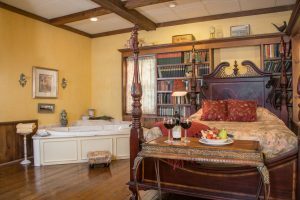 Featuring a luxurious four-poster bed, a cozy library corner by the fireplace, and a beautiful sitting area by the garden, this suite has everything you need, and more, for your special getaway. Plus, you’ll wake up to delicious breakfasts each morning! Come and experience the beauty, charm, and history of Western NY by staying at Asa Ransom House! We look forward to seeing you! Would you like to discover even more historical sites and attractions throughout the area? You can find dozens of them inside our free Vacation Guide!